class="post-template-default single single-post postid-354366 single-format-standard group-blog masthead-fixed full-width singular wpb-js-composer js-comp-ver-5.7 vc_responsive"
Kearney, Neb. – Senior guard Kevin Miller scored four of his game-high 33 points in the final 41 seconds of overtime to lift Hastings College over Nebraska-Kearney, 87-83, Tuesday night at the Health & Sports Center. This was the 194th all-time meeting between the Broncos (11-4) and Lopers (4-6). Per NAIA rules this was an exhibition game for Hastings; they play another one tomorrow night at Augustana. A young UNK squad now has lost three games by a total of 11 points. The Broncos led for just 2:46 all night but never let the UNK lead get bigger than 11 points. A 12-4 Hastings run to end the second half sent the game into overtime. Senior reserve forward Ben Wahlberg grabbed an offensive rebound and converted a three point-play with 24 seconds left to give Hastings a 76-74 lead. It marked just the second time all game the Broncos were ahead. Freshman Kanon Koster (Kearney H.S.) responded with a driving base line up to the things up with 11 seconds remaining but missed the ensuing free throw. Miller had a chance to win it but his pocket was picked and a half-court heave by Koster didn’t fall as the buzzer sounded. Making his first five shots of the night but sitting out nine minutes in the first half due to foul trouble, Miller converted a layup with 41 seconds left to give the Broncos the lead for good at 84-83. 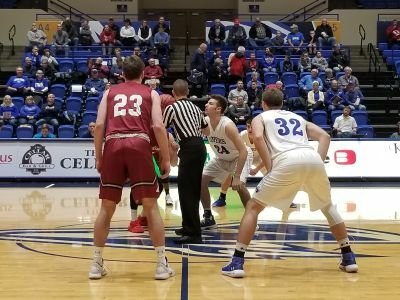 A three by junior guard Chase Winchester (DeSoto, Texas) didn’t fall soon after but UNK had another chance as Hastings missed the front end of a one-and-one free throw. However, the Lopers couldn’t coral the tipped ball and the Broncos retained possession. Not surprisingly, Miller got it and knocked down two free throws. A contested three from the left wing by senior Kyle Juhl (Harlan, Ia.) misfired with six seconds left and Hastings made one more freebie to close out the scoring. “On their end of it, when someone got into the lane and kicked it out their guys found a way to knock it down especially in crucial situations. We weren’t able to do that so hats off to them,” said Loper head coach Kevin Lofton. A 6-2 guard from Los Angeles, Miller went 14 of 19 (2 of 4 threes) from the field and 3 of 4 at the line. Averaging 18.9 points per game on the year, he also had five boards and three assists. Shooting 49 percent (33 of 67) from the field and tallying 19 points off 17 Loper turnovers, Hastings also got a double double from junior forward Bart Hiscock (15 points & 12 rebounds) with junior reserve forward Zach Kitten providing 14 points and six boards. Both Koster and Winchester had season-high offensive nights to lead UNK. Koster tallied 21 of his team-high 30 after the break with Winchester hitting five threes to score 21. The pair combined for 33 of UNK’s 43 points in the second half and overtime. Koster finished 13 of 21 (3 of 6) threes) from the field with Winchester making 8 of 18 shots. Koster also had team-highs in boards (nine) and assists (six) while Winchester logged a team-high 43 minutes. The 30 points by Koster is the most by a Loper freshman since Trey Lansman had 35 in a 2014-15 road loss at Fort Hays State. Finally, Bellevue junior forward AJ Jackson had seven points, six rebounds, four steals and two assists. UNK shot 51 percent (33 of 65) from the field including a 10 of 29 effort from downtown. However, they were 7 of 13 at the line and were out rebounded by a 39-35 margin. The Lopers are now off until Saturday, December 29 when they host Nebraska Christian. UNK will resume practice on Thursday, December 27.